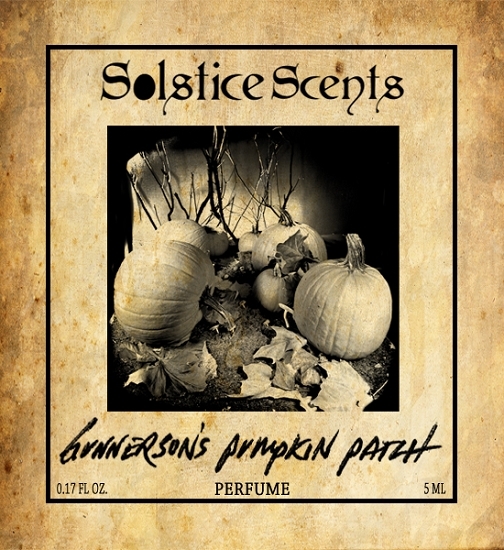 Gunnerson's Pumpkin Patch is a cool-toned coumarin heavy fougere with gourmand overtones. It is an atmospheric concept that features damp and cool Earthy autumn scents of leaves, dirt, raw pumpkin flesh and vines, moss, balsam and mushroom paired with coumarin-rich notes from hay, lavender and tonka bean, sweetened with a ripple of caramel and the faintest hint of spice and finally enhanced with a warm, soft, wood smoke in the distance. This scent is an interpretation of the pumpkin patch experience itself, rather than a pumpkin pie spice focused gourmand. Many natural and synthetic elements are used to create the autumnal outdoor experience. The gourmand aspect comes from the sweet coumarin notes that have been paired with Gunnerson's homemade pumpkin-caramel chews and the faintest trace of flaky pumpkin pie crust and spice. Gunnerson's has a cool feeling along the lines of our Cellar fragrance but without the dirt note being quite as rich and strong. It does have both pumpkin and patch(ouli). Gunnerson's opens with a sweet and strong blast of lavender and tonka wrapped in leaves, moss and autumn air with a hint of dew. After a bit, raw pumpkin flesh wafts in and out as the lavender begins to soften. A thick melting caramel river flows over dirt, leaves and warm pumpkin, sprinkled with a very faint blend of spices. Gunnerson's has a warm, cozy molten core that emerges as it morphs. If you're looking for a more traditional spicy pumpkin pie gourmand-focused scent, try Kitchen. We also have spicy Pumpkin Spice Latte. Another option for a darker pumpkin pie spice fragrance is Jack & the Devil, which is dirtied up with a generous amount of amber, oakmoss and patchouli. Gunnerson's captures a different atmosphere and merges a more forest heavy fougere blend with gourmand overtones.